8:43: Amazing how close to an hour between posts I get. I’ve become distracted from the Golden Globes by impending PAIN, so probably no more blogging for me alas, not that I was really blogging them anyway! 7:42: I’ve been getting email about my surgery tomorrow. It’s impossible to relax. 6:42: I’m here. I’m a little late. Who did I miss? Claire Danes, I can’t believe she had a baby a month ago, Katherine McPhee was kinda cold to Ryan Seacrest, Zooey Deschanel was funny pointing out how Lucy Liu was oblivious last year when Zooey had to disengage her dress from Lucy’s, and Lena Dunham, not sure what to say, still loving the short hair. Where are the cats? CATS? 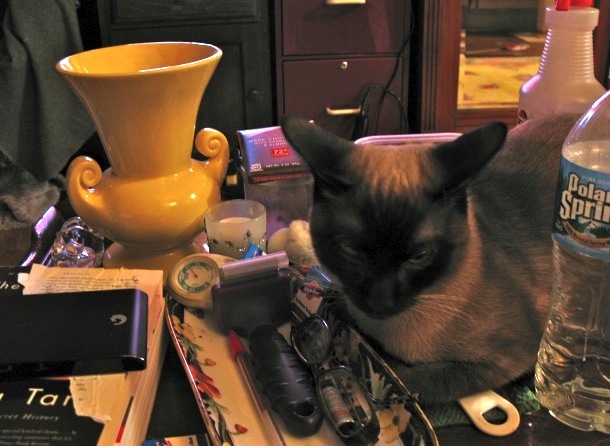 There’s one in the mess that is my coffee table. I have to turn over to Downton Abbey in a few minutes. Will check your blog in the morning to see what I’ll miss. Fingers crossed for your surgery. Awwww, thank you. And I’m fine. I went out and got myself macaroni and cheese from City Bakery! Stacy, is that an Abingdon Pottery vase? It says McCoy very faintly on the bottom.